Spring-time in New England signifies new beginnings as green shoots of life spring up from the earth, songs of happy birds return, and fresh new routines emerge in response to longer, warmer days. To accompany this delightful weather, I decided to “go raw” with this fresh chopped salad featuring sprouted quinoa, one of my favorite protein sources. I’ve chosen to use scallions, red bell pepper, and carrot though I would also try it with raw broccoli or sugar snap peas. What really made this salad come together was the addition of toasted cumin seeds which I prepared over medium heat in a dry cast iron pan. I found the taste of this little nutty seed to be the perfect complement to the otherwise simple and pure dish. I dressed the sprouted quinoa salad with a lemon vinaigrette and served it over a bed of kale with a wedge of lemon for garnish. This salad and a cool Spring breeze was a centering experience that helped me feel at once focused and sattvic (sanskrit word for pure, clean and wholesome). 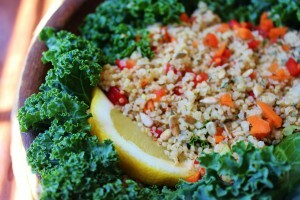 1 cup of sprouted quinoa (soak in water for 35-40 min. or until desire crunchiness is achieved). You can also cook the sprouts for a fluffier, softer texture if preferred. Place washed and dried salad greens in bottom of medium-sized salad bowl. 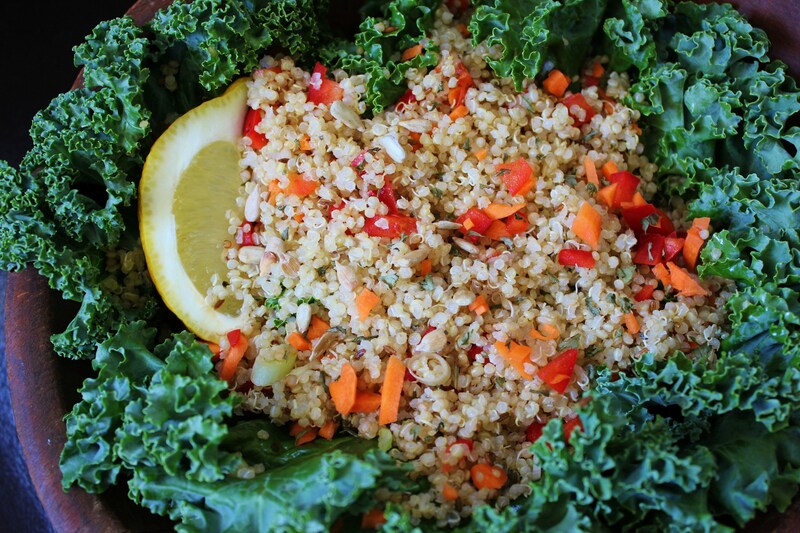 In a mixing bowl, stir together quinoa and chopped vegetables. Whisk together the ingredients for the vinaigrette and drizzle over top. Optional: Add toasted sunflower seeds on top and/or fresh parsley.